Lab equipment & instruments. 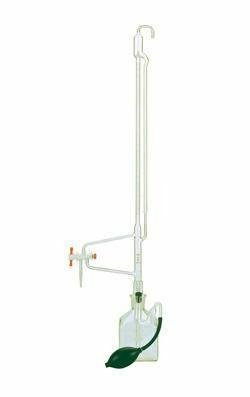 37918-0110 automatic self-zeroing and supporting burette, 15 ml; 1/pk. Manufactured by Cole-Parmer. Cole-Parmer brand products. This 50mL automatic self-zeroing acrylic buret is durable and easy-to-use. Furnished complete with PMP stopcock Teflon TFE plug 3 feet of plastic tubing and LDPE squeeze bottle with PP screwcap closure. Crystal-clear buret is safer than glass and offers repeatable accurate results. Individually calibrated to meet the accuracy requirements of ASTM E287. Unaffected by dilute mineral acids and bases except hydrofluoric acid and ammonium hydroxide. The pH range of 1-14 is ideal and up to 5% wt/wt of acids or 30% bases can be used. Buret is not designed for exposure to alcohol and organic solvents. Transparent. Automatic self-zeroing. Material: acrylic buret body with PMP stopcock Teflon TFE plug 3 feet of plastic tubing and LDPE squeeze bottle with PP screwcap closure. Capacity: 50mL. Nalgene #: 3640-0050. 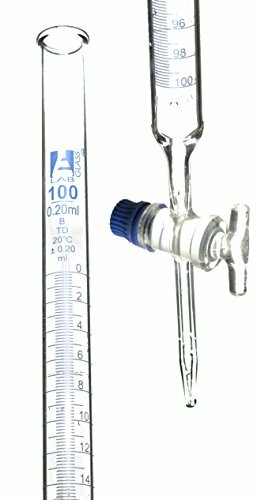 With two vertical necks and a round bottom, these borosilicate glass flasks feature a side neck Standard Taper 24/40 outer joint. The center Standard Taper joint varies with flask capacity. Limited 90-day warranty included. Scientists rely on the expertise and artistic skills of Wilmad-LabGlass' engineers and glass specialists to manufacture NMR and EPR consumables and laboratory glassware of the highest quality. Used daily in academia, healthcare and chemical, petroleum and other industrial applications, Wilmad offers 7000+ items as part of their standard catalog as well as custom fabrication for individual glassware, glass repair services and OEM glass parts. This 25mL automatic self-zeroing acrylic buret is durable and easy-to-use. Furnished complete with PMP stopcock Teflon TFE plug 3 feet of plastic tubing and LDPE squeeze bottle with PP screwcap closure. Crystal-clear buret is safer than glass and offers repeatable accurate results. Individually calibrated to meet the accuracy requirements of ASTM E287. Unaffected by dilute mineral acids and bases except hydrofluoric acid and ammonium hydroxide. The pH range of 1-14 is ideal and up to 5% wt/wt of acids or 30% bases can be used. Buret is not designed for exposure to alcohol and organic solvents. Transparent. Automatic self-zeroing. Material: acrylic buret body with PMP stopcock Teflon TFE plug 3 feet of plastic tubing and LDPE squeeze bottle with PP screwcap closure. Capacity: 25mL. Nalgene #: 3640-0025. The Automatic Burette has a ground glass stopcock with a clear storage container for storing and dispensing standard solutions. It includes a clear reservoir bottle with a rubber stopper; self-leveling burette, which is made of borosilicated glass and is permanently graduated; a rubber atomizer bulb; and a glass tube connector. It is numbered every 1ml and has 0.1ml subdivisions. 25ml Capacity. 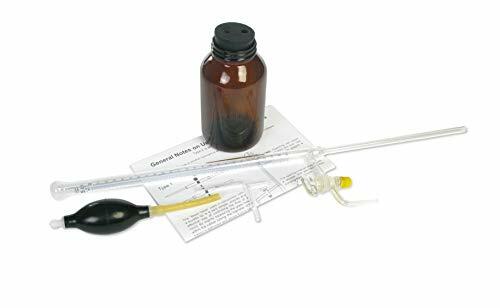 This kit makes any plastic or glass 25- or 50-mL buret self-zeroing economically and easily. 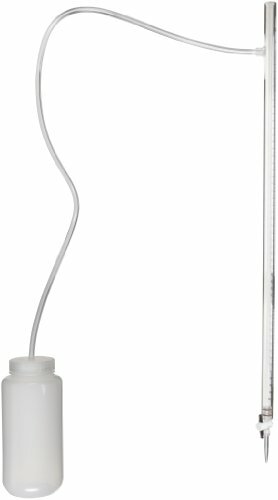 Saves you money over costly glass self-zeroing burets. No more funneling; hazardous wasteful spills are eliminated. Can be used with almost all aqueous titrants. Set adjustable fill-tube to zero mark on buret. Squeeze bottle to fill buret (not included) just above zero mark. Release and excess liquid returns to bottle and titrant falls to the zero mark. To switch to a different size buret simply reverse the adapter. Extra closure without tubing hole is included for storing titrants or carrying to the field. 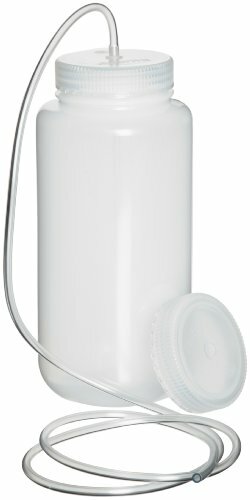 Material: LDPE bottle 4-feet of PVC tubing and polypropylene filling tube and adapter. Capacity: 1000mL. Nalgene #: 3645-2550. 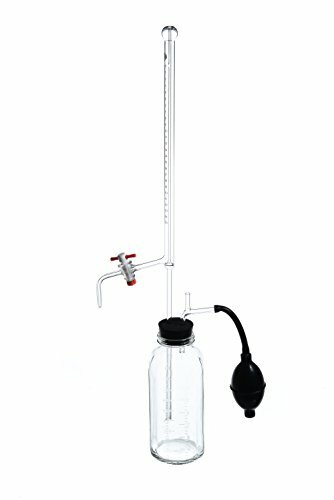 The Automatic Burette has a ground glass stopcock with an amber storage container for storing and dispensing standard solutions. 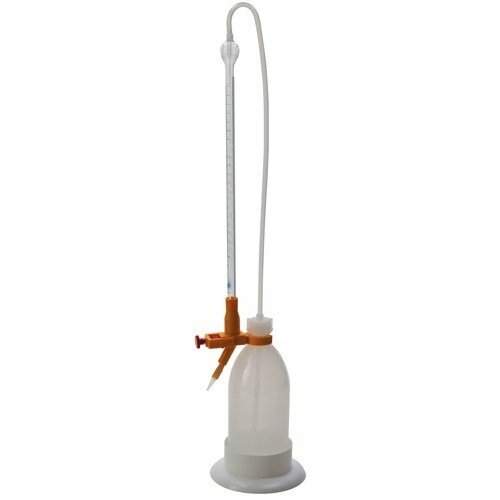 It includes an amber reservoir bottle with a rubber stopper; selfleveling burette, which is made of borosilicated glass and is permanently graduated; a rubber atomizer bulb; and a glass tube connector. It is numbered every 1ml and has 0.1ml subdivisions. 25ml Capacity. Size:50mL Research, industrial and healthcare professionals rely on SP Scienceware for their sample handling needs. Sold worldwide, Bel-Art and H-B Instrument brand laboratory supplies include over 5,000 items from safety wash bottles to fume hoods, thermometers, racks, desiccators, hydrometers, ice buckets, scoops and spoons. Custom calibration services, plastic molding, specialty coatings and wire manufacturing are also available. Wilmad-LabGlass brand laboratory glassware complements Bel-Art and H-B Instrument with over 7000 items including NMR and EPR consumables and specialty glassware, as well as custom fabrication for individual glassware, glass repair services and OEM glass parts. SP Scienceware is a division of Warminster, PA based SP Industries which also include SP Scientific laboratory, thermal management, and pharmaceutical production equipment and SP Ableware aids for daily living. 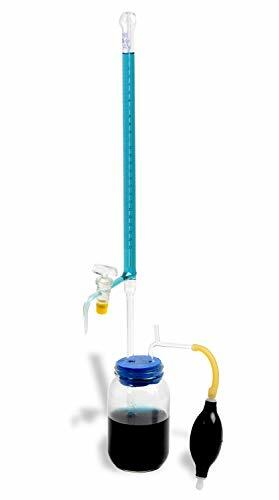 50mL precision bore burette is permanently marked with an individual serial number. Supplied with a Certificate of Graduation Accuracy. Packed complete with a reservoir bottle, U-shaped drying tube, vented connecting tube, rubber squeeze bulb, # 1 one-holed rubber stopper and " I.D. rubber tubing. Stopcock for all sizes is standard 2mm bore size. Scale is durable black ceramic enamel. Calibrated to the accuracy requirements found in ASTM Specification E694. Class A Serialized/Certified. Replacement stopcock is S6445. Kimble #: 17124F-50. 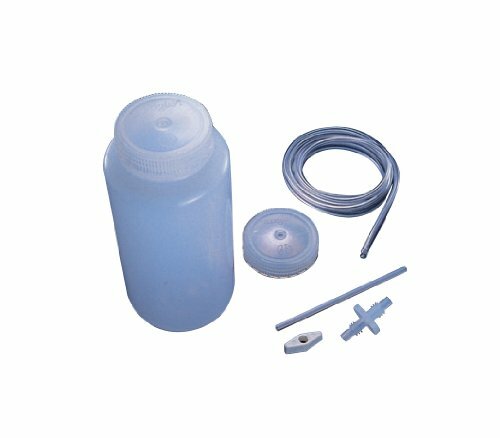 Kit includes a 1,000 mL LDPE squeeze-bottle; 1.2 meters of 1/8 bore clear PVC tubing; polypropylene fill-tube; polypropylene adapter plug which is reversible to fit either size buret; and two size 63 polypropylene screw caps, one with central hole for tubing and one without hole. 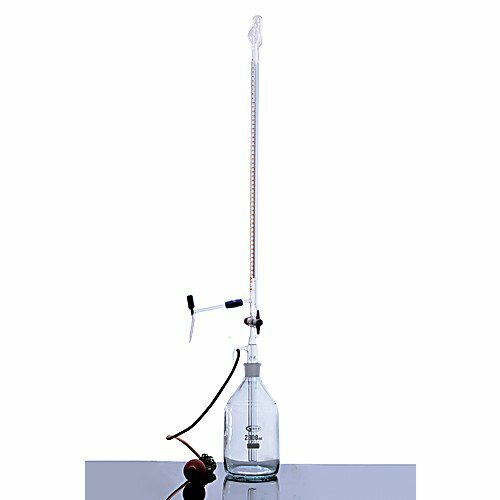 The product Type is titrating burette, automatic, self zeroing, glass/LDPE, 10Ml. Country of origin is Germany, manufacturer of this product is Dynalon.
" KIMAX precision bore automatic burets are used in applications requiring the highest degree of precision and accuracy for volumetric analysis Manufactured to the specifications found in ASTM E694. Calibrated to the accuracy requirements found in ASTM Specification E542. Manufactured from 33 expansion, low extractable borosilicate glass conforming to USP Type I and ASTM E438, Type I, Class A requirements. 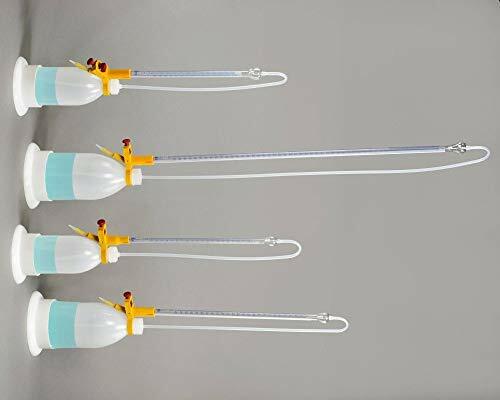 These are ideal for repeat titrations requiring traceable volumetric accuracy or when the titrant should not be handled.Packed complete with a reservoir bottle, U-shaped drying tube, vented connecting tube, rubber squeeze bulb, #1 single-holed rubber stopper, PTFE stopcock plug and 1/4 inch ID rubber tubing. " 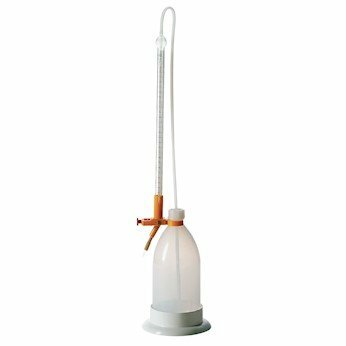 Replacement tube for 25ml automatic burette with ground glass stopcock.